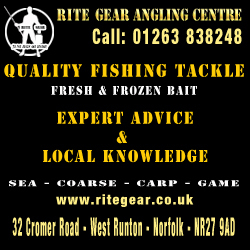 16 anglers arrived at Trimingham to a rather large sea. It was decided that in case there was a lot of tide pull that it would be a rover as long as you were close to someone to get your card signed. A few went for a hike to the left and some stayed right. From the start it there was no troublesome weed nor was the any tide pull so we were hopeful for some bigger fish. Unfortunately the fish didn’t come to play but there was a few undersize for some people. Towards the end of the match there was a bit more pull and a little weed. Once everyone had returned it was clear that it wasn’t an easy match and only one angler had manged to card and did so in style with 3 fish not just the one. Well done to Russell Taylor for winning with 3 fish for 14oz. Next week we are at Kelling (meet at gate at 6) so if you are attending please let me know asap as well for bait as on my own next week.